Object Theory co-founder Raven Zachary. While Zachary is very interested in both augmented reality and virtual reality, he decided to start his next company, Object Theory, with a focus on Microsoft’s HoloLens development. The iPhoneDevCamp conference he started prior to the launch of an official iPhone App Store was a major conference and a powerful force for inspiring early hack-to-get-it-to-work creativity in the mobile app development market. His stature as a developer who both correctly identified a world-changing trend in computing software and harnessed it early on to create influential apps makes him one of the best people to ask about the emerging market for mixed reality technologies. I sent some questions over email to Zachary and, with the announcement this week that development kits for HoloLens are coming early next year for $3,000, now seems like a good time to put together his answers into a Q&A that might provide some insights into this new industry. Do you think the $3,000 cost to developers might limit HoloLens somehow when it hits the market at the same time as consumer VR? VR and AR aren’t really actively competing in the market at this stage. The longer-term projection for AR is much larger and broader than VR. AR will have a more profound impact on society, and will be more actively used in commercial settings. VR has a place, but it will be more of a niche product in specialized areas, such as gaming, entertainment, and therapy. I am bullish on both VR and AR, but I believe AR is the better fit for most use cases, and Microsoft is the leader in this area. VR has had a head start in terms of mindshare and activity, so you’re seeing more taking place in this space now. 2017 and beyond, this is a different story altogether. Mixed Reality makes this debate less relevant as we will ultimately see a blurring between these technologies. You started mobile app development very early on. Can you compare and contrast the state of that industry at its start to where we are now with mixed reality technologies? I started my mobile app company, Small Society, in early 2009, more than six months after the launch of the App Store. Prior to that, I had been doing some advisory work to help the 2008 Obama Campaign and a few companies launch their iPhone apps to market and had created iPhoneDevCamp the year before. Where I am with the launch of Object Theory for Microsoft HoloLens is distinctly different than where I was with the launch of Small Society in the mobile app business. Object Theory was launched in advance of the product. This would have been akin to me having launched my mobile app business in 2007 before there was a native iOS SDK and an App Store. This comes with some risks, of course, but risks we believe are manageable. Developing applications for new technology takes time. There is a lot to learn and revise before you bring software to market on a new platform. What made you decide to move on from mobile apps? I spent eight years in mobile, and it felt like the right time to explore something new. I’ve been excited about virtual reality and augmented reality for decades. I remember reading an issue of Rolling Stone magazine when I was in high school that featured an interview with Jaron Lanier discussing the future of VR. In the mid 1990s, I worked at Los Alamos National Laboratory and across the hall from my office, there was a technology researcher who told me about AR and showed me an early academic research video about the topic. That was a light bulb moment for me and I knew that someday I would work with AR – it took two decades to get there. Last year, I spent a good deal of time evaluating the creation of a VR company, but ultimately struggled to find a clear fit in these early days for business customers. I have no background in gaming or entertainment, where VR will be a big success out of the gate. When Microsoft announced HoloLens in late January 2015, it was apparent that this was what I wanted to do. The decision was made easier for me when I discovered shortly thereafter that a friend of mine was at Microsoft working on HoloLens, and he ended up as my business partner. What are you most excited about doing with HoloLens? What about with Rift or Vive? We are working with enterprise customers now on building HoloLens applications that can add tremendous value in how teams collaborate and how 3D information is displayed and interacted with. We’re not ready to make any client announcements at this time. 3D has been stuck on 2D monitors, and HoloLens allows us to display 3D in our real world, which sounds simple, but is quite profound, actually. As a species, we’ve been interacting with 3D objects in 3D for millennia. 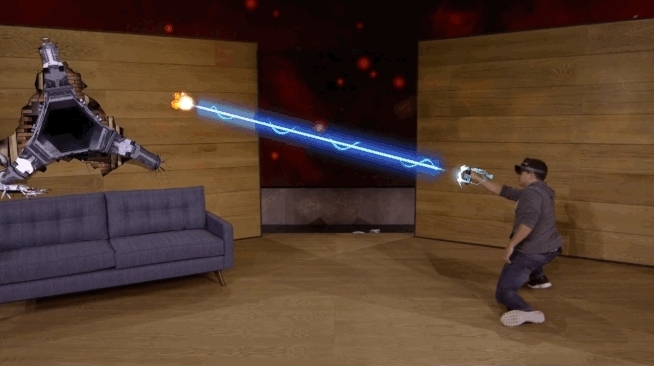 HoloLens gets us back to a more natural way of interacting with the world. The 2D experience isn’t going away, though. Some things are more efficient in two dimensions. I do own an Oculus DK2 and a GearVR, and try to stay up to date on VR experiences as best as I can. I’ve had the opportunity to use a Vive, and it’s the best VR experience I’ve had to date, although I have not yet tried the Oculus Touch controllers, which I am told are also quite good. Physical mobility in VR is a key element to presence, and the Vive provides that. You’ve mentioned not planning on App Store sales but instead internal projects for clients. Do you see that model changing into projects aimed at App Store sales and how far off do you think that shift would be? I can only assume that Microsoft will extend Windows Store to allow for downloading HoloLens apps once the product is released publicly. The Windows Store is an important part of Windows 10 device family. As all of the apps we are working on now are for internal use by our clients, the Windows Store will impact our business less as we are not a consumer-focused company. We expect that clients will load the apps that we build for them directly onto HoloLens devices. When I see things like ViveCraft and Tilt Brush I see hints of tools that could be useful beyond abstract art or entertainment. Those hand controllers seem key to unlocking much deeper functionality in VR. How do you think Oculus Touch and the SteamVR wireless controllers compare to Microsoft’s HoloLens approach to interaction with virtual content? Microsoft showed off a “HoloLens Gauntlet” when demoing Project XRAY on-stage at the Windows 10 Devices media event on October 6th. I think it’s safe to assume that you will see hand controllers and accessories play a part in the HoloLens ecosystem. Gesture and voice are also very powerful ways to interface with HoloLens. Great experiences will use the best tools for the job.